King’s Landing, heart of power in Westeros, location of the Iron Throne. This city acts as the fulcrum for the plots and machinations of the warring factions of the Seven Kingdoms. This map is something of a dichotomy. It contains more detail than any of the world or regional maps, but fewer named locations. To see the high resolution version, you’ll need to pick up the poster map folio – The Lands of Ice and Fire – but if you want to see some detail shots, read on after the jump. Rhaenys’ Hill looms over Flea Bottom casting a long shadow. 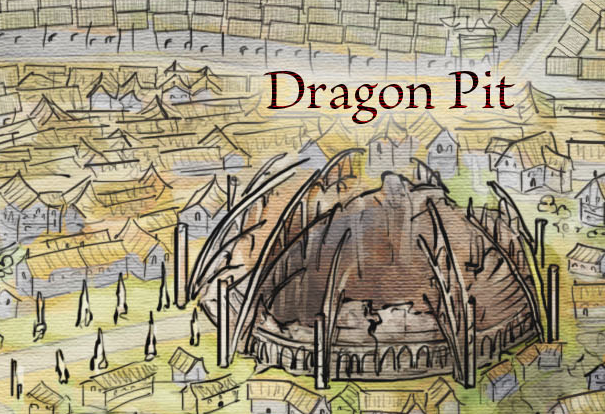 On top of the hill sit the ruins of the Dragon Pit – a reminder of the depredations of Targaryen rule. 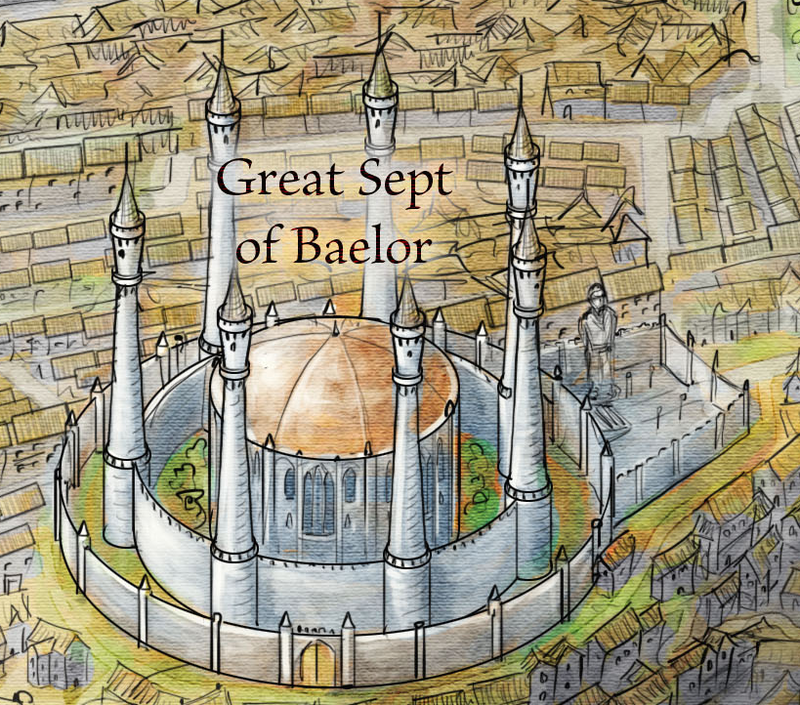 Visnya’s Hill hosts the Great Sept of Baelor – complete with it’s metal dome and of course the square in front where judgements are passed. 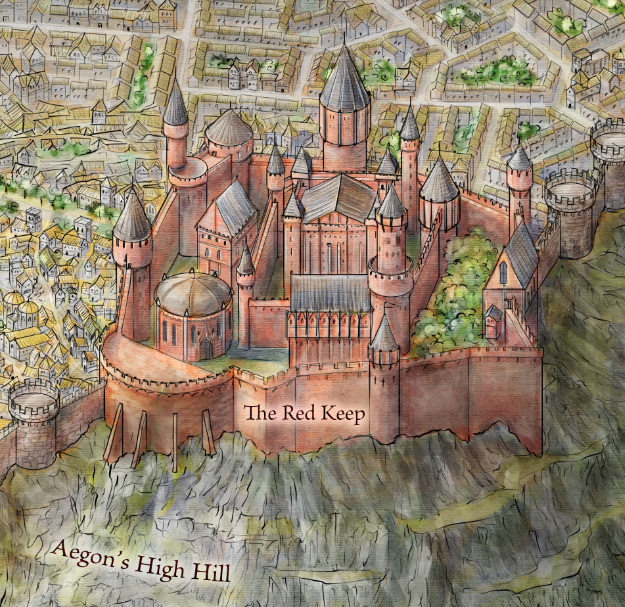 This, like the Red Keep, was referenced from the wonderful illustration of King’s Landing by Ted Nasmith. The Keep comes complete with all the towers, from White Sword Tower to the Tower of the Hand, the Maidenvault, and of course, Maegor’s Holdfast. It stands atop the towering rocks of Aegon’s High Hill. One of the challenges of this map was the vertical scale. King’s Landing is a big city. It contains around half a million people. So the buildings can’t actually be totally representative. Also, the featured locations couldn’t be drawn precisely to scale – or they’d be small blips in a sea of rooftops. Instead, the featured locations are pulled out to be many times their real size, and they dominate the map. The flip side of this choice is that they make the hills look smaller in comparison. To get an idea of the scale of the hills, check out their size compared to the houses. The other part of this is that the map is viewed from a high altitude. This angle helps us see most of the road network (this is a map after all), but foreshortens the vertical dimension. To create the map, I first draw the plan view of the whole city, and then added skew and perspective, and finally warped the roads to account for the height of the hills. With the skewed road network in place, the long job of detailing the buildings began. The featured locations get pulled out in different ways. Shae’s Manse, like other mansions in the city gets more of a splash of colour, and higher contrast to help it stand out from the surrounding buildings. Making it bigger didn’t work, as that implied a grander scale than it was. She’s being hidden after all. But the Manse does get a wall, to suggest the protection Tyrion craves for his beloved. In this shot you can also see the urban sprawl beyond the city walls. King’s Landing has been besieged many times, but there are always those willing to rebuild the burned out shells beyond the protection of the walls. 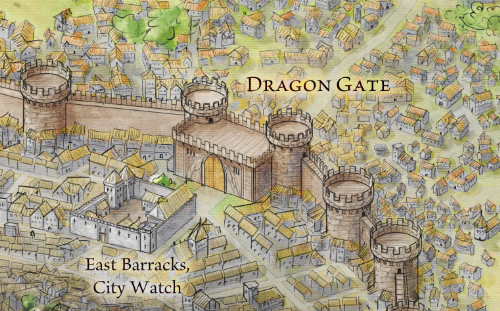 Talking of urban sprawl, here’s the Dragon Gate – a massive fortified bastion, guarded by the East Barracks. You might even be able to spot the golden flags of the Gold Cloaks flying high over the barracks. Inside the walls, buildings jam against the cities fortifications, using them for a free back wall. Outside, the buildings sprawl across the nearby land, focused around the main roads, but leaching out into the farmlands that surround the city. Finally, we visit the Tourney Grounds. The grounds are arrayed outside the King’s Gate, and the bright silks bring a splash of colour to the west of the city. 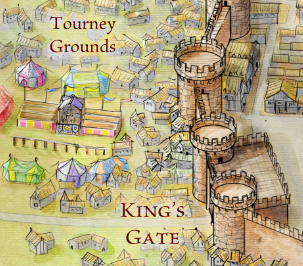 The Tourney Grounds are the focus of some of the earliest action in King’s Landing, and represent to me a lot of the lost innocence. It was a good excuse to use more saturated, summer colours for this part of the map. King’s Landing was a joy and a challenge to illustrate. It is, first and foremost, a map. But the 3/4 style means that it has to also be an illustration. Walking the fine line between channeling the flow of information, and providing an attractive illustration of a city, was a fun task in which I learned a lot. I tackled Braavos after tackling King’s Landing and I’ll discuss some of the differences between the cities when we get to the Braavos map. Absolutely astonishing work! Fantastic, indeed! The maps are all 24″ by 36″ – and they were created at 350dpi in Photoshop. That makes them 8400px by 12600px – more than 105 megapixels! I’ll tell you this…. these maps you made go with the theme so well, I nearly cried in happiness. This map in particular seems to have that medieval touch to it (something Mr. Martin would have loved, I presume). Great work! And good luck! Thanks. This was a big map to draw. Those houses took quite a while to illustrate – I’m really glad you enjoyed it! I’m guessing you’ve caught an inconsistency there. I can’t find the details of why Eel Alley was placed there on the map, but you might well be correct about it being misplaced. I’m glad you’re enjoying them! And indeed Arya accesses the fish market and the river. This last quote seems to imply there’s a way to reach the riverfront without passing the Mud Gate, since Arya is on her way to it, but I can’t see this way on your map. 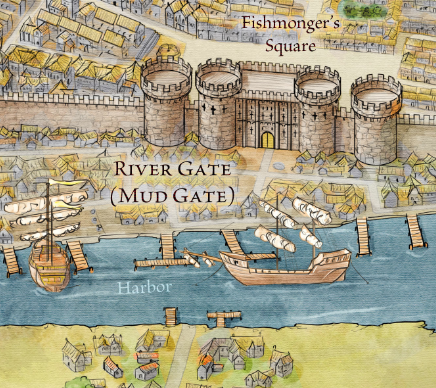 But on the other hand, it doesn’t seem plausible to have the river cross the city’s walls, or the walls ending when they reach the river. So do I miss something here, or is there an inconsistency in the book itself ? We did discuss the details of these sorts of routes a bit. I’ll have to go back through my notes on that one. That’s poor city planning. Defenders really really don’t want houses right up against the walls, either on the outside or the inside. 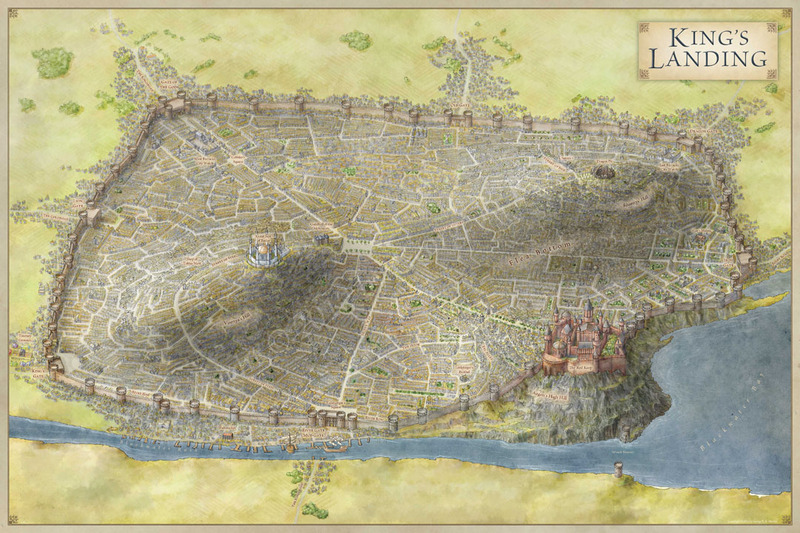 Is this sprawl a legacy from the age of dragons when nobody dared besiege King’s Landing? The harbor area also appears completely open to an attack from the West. A raider could cause a decent amount of economic disruption by torching the area. Indeed. Cities that haven’t been attacked for a while tend to have houses beside the city walls. It’s a lot cheaper to build a house when one of your walls has been built for you! And houses tend to get built and rebuilt quickly. So many of the houses against the wall are post-Robert’s campaign. I will be using your maps to make my minecraft game of thrones world thanks! Awesome! I love seeing where these maps turn up. That is the same reason why I came here, I can’t wait to see what a minecraft kings landing turns out like! I got the 2*3 feet silk map of this in the limited edition GRRM Box, I love the detail!